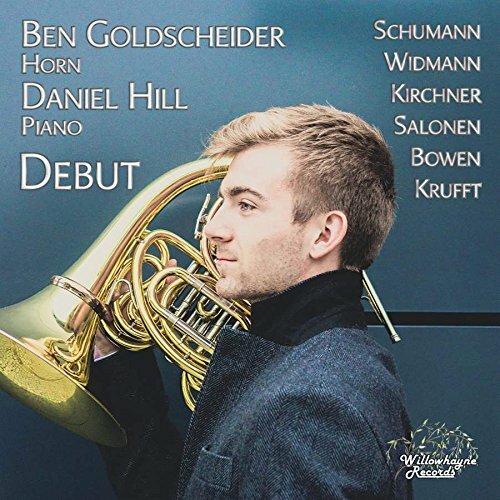 The young French Horn player Ben Goldscheider won the BBC Young Musician Brass Category Final in 2016 and currently studies at the Barenboim-Said Academy in Berlin. His debut disc was recently released on Willowhayne records [see my review], with an eclectic mix of music by Esa-Pekka Salonen, Jörg Widmann, Robert Schumann, Volker David Kirchner, York Bowen and Nikolaus von Krufft. 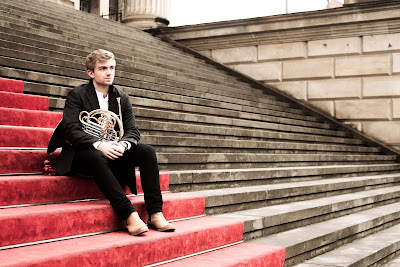 Ben recently performed Mozart's Horn Concerto No. 4 with the European Union Chamber Orchestra at St John's Smith Square, and I took the opportunity to meet up with him before rehearsals to chat more about life as a young French Horn player. Besides studying, Ben has a busy schedule both as a soloist and playing in orchestras. But he is clear that he wants to be a horn soloist and is keen to promote the horn as a solo instrument. He feels that currently there is no-one promoting the instrument the way Dennis Brain and Barry Tuckwell did. Though Ben is young he wants to try and is engagingly eager to expand the repertoire. 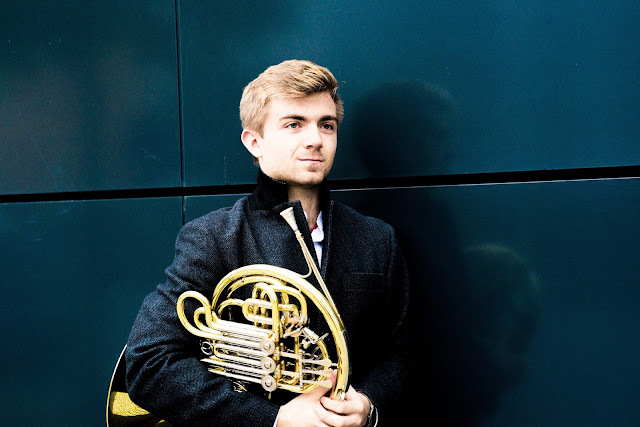 The instrument lacks the wide repertoire of instruments like the violin, but there are eight great concertos (four by Mozart, two by Strauss and two attributed to Haydn) and Ben is keen to explore contemporary music too, keen to work with composers and to develop the art form. For his album, whose title is Debut, he did not feel that it would be sensible to record the great repertoire, he would regret it in 10 years times and it was not repertoire that he wanted to put his stamp on yet. Instead, the disc is a journey through the horn's development from the early 19th century. So the programme starts in the 21st century with Jörg Widmann's Air for solo horn's contemporary colours and techniques, then moves back to the classical period for Nicolas von Krufft's Sonata for Piano and Horn. Schumann's Adagio and Allegro is the best-known work on the disc, and Ben included it because it was the first major work for the valve horn, also he feels that it is nice for there to be something familiar for people to latch on to. On the disc, he follows this with early and late 20th century pieces, the real rarity of York Bowen's Sonata for Horn and Piano and Volker David Kircher's more modern Tre poemi. Not mainstream pieces, but still great repertoire. As a young artist, Ben wanted to present himself on a CD, rather than make another Mozart recording for the sake of it. He also wanted to show different repertoire, in order to introduce people to it. Remarkably his recording of Sallinnen's Concert Etude, which Ben feels is a fantastic piece, has received over 2000 hits on Spotify. He played it at the BBC Young Musician competition and beforehand had 90 minutes on Skype with Sallinnen himself. Ben also spent a lot of time on Jörg Widmann's Air for solo horn in Berlin where Widmann is in residence at Pierre Boulez Saal which is attached to the Barenboim-Said Academy. Ben is in the second year of a four year course at the Barenboim-Said Academy. He describes it as fascinating, as the course combines the study of music and humanity so that Beethoven's music will be studied with the literature of the period and the history, to produce a rounded education. Ben is studying with his hero, Radek Baborák, who invited Ben to study there. The experience includes close contact with Daniel Barenboim, which Ben talks about as amazing and Ben has been able to play trios with Barenboim in the Pierre Boulez Saal. He also plays the horn in West-Eastern Divan Orchestra and sometimes with the Berlin Staatskapelle (once principal horn and the rest third horn). He is also enjoying Berlin, with its orchestras and opera houses it is buzzing musically, with world-class music every night. The academy is very special, there are no tuition fees, a huge scholarship and a great opportunity. Currently, it is only in its third year, with 56 students, working towards 90 in total. The first year was a pilot programme and Ben was in the first full intake and is the only horn player. Ben regards his teacher Radek Baborák as his musical hero, and also cites the horn players Dennis Brain and Hermann Baumann, both of whom possessed an individual style and did something unique in their own way. Whilst Ben plans for a solo career, he currently finds orchestral playing extremely important as it enables him to learn so much about the music. We don't have Mahler, Tchaikovsky and Brahms horn concertos, so Ben feels that he can learn a lot by performing the symphonic repertoire and playing with colleagues, so he is grateful for the invitations from the orchestras. He sees chamber music as just as important as solo performances and finds it amazing to play with others, especially as it gives you the type of freedom that soloists have. Both Ben's parents were professional musicians and he started the cello age six. He was diagnosed with a lung condition, bronchiectasis, quite serious, his lung function was 50% and he spent a long time in hospital. It was hoped that playing a brass instrument and doing a lot of sport would be beneficial in strengthening his lungs. This seems to have been something of a success, he has not been back to hospital for six years, his condition is under control and he has no day to day conditions. At the beginning, he didn't want to practice, and like many young pupils had to be persuaded but around the age of 12 or 13, it went to being his greatest passion with a dedicated goal of professional music. On family holidays, he would get up early to practice with a special mute, he was crazy about it. Looking ahead, Ben will be playing Esa Pekka Salonen's Concert Etude at Milton Court in March and has a number of chamber music concerts with Daniel Barenboim in the Pierre Boulez Saal in Berlin, and will be performing Haydn's Concerto in D with Das Sinfonie Orchester at the Philharmonie in Berlin. He will also be playing this Summer at the Verbier Festival. Full details from Ben Goldscheider's website.